As we say goodbye to Spocktober 2011, I’d like to take a moment to share some thoughts on our favorite Vulcan. As the above image illustrates, I think there’s something distinctive – even sacred – about Spock that causes us to be continually drawn to him. Spock is not just Star Trek‘s most popular character; he is at its very core. Spock has been with Star Trek from the very beginning. He is the only character from the original, rejected pilot “The Cage” to continue as a series regular. Spock has been Star Trek‘s wisdom, its conscience, its moral core. Because of that, Leonard Nimoy, the actor who portrayed him for Star Trek‘s first 45 years, has been the same. But what’s sacred about Spock? To be sacred means to be set apart, dedicated, consecrated. It can mean dedication to God or to a particular purpose. In Spock, we see a character who is set apart in many ways. As both Lisa M. Lynch and T’Nara Valdrin Kelensa have noted in their Spocktober guest posts, Spock is a citizen of two cultures. In both cultures, however, he is different – unique, but also alone. His dedication to Vulcan principles makes him an outsider among humans because he rejects their way of life, but also, oddly enough, among Vulcans as well because he is half human. Rejection seems an odd way to come by holiness, but it’s one that the Scriptures continually refer to. As Jesus himself said, “I tell you the truth, no prophet is acceptablein his hometown.” (Luke 4:24, NET) But Spock also sets himself apart. Though he had the opportunity to continue his family’s tradition and complete his studies at the Vulcan Science Academy, Spock chose instead to join Starfleet. Similarly, he left Starfleet to return to Vulcan and complete the kolinahr ritual, which would rid him of all emotions. However, he later rejected this plan and returned to Starfleet. In each of these three decisions, we see Spock seeking his true self by separating himself off from others. Jesus behaved similarly, isolating himself in the desert before he began his ministry, across a sea after the death of John the Baptist and away from his disciples in the Garden of Gethsemane before his crucifixion. Each of these moments of separation seem to represent Jesus’ desire to re-center himself, to seek the right path and to prepare for great changes in his life. He sought purity in the desert in preparation for his ministry, sought solace during a time of grief when the man he admired most was killed and begged his Father for another answer when he was called to sacrifice his life. Spock left Vulcan for Starfleet to live apart from both Earth and Vulcan, two planets that could not be his home. He sought purity in the desert through kolinahr, but realized that this was a temptation toward an easier life – much like the desert temptation Jesus faced to give in to disordered human desires. When he again left Vulcan to accompany Kirk and his old Enterprise comrades during the V’Ger incident, Spock remained somewhat distant and isolated, ultimately venturing out into space alone and carrying his personal quest deep into the heart of V’Ger. In this way, he separated himself from Vulcan and also from his friends (as Christ did in Gethsemane) in a quest for balance in his life, which he found. Spock is also dedicated. Whether loyal by duty to Starfleet, by upbringing to Logic or (whether he admits it or not) by love to his friends, Spock is a devotee. Given that the Star Trek universe is supposed to be a place where religion has passed away from human experience, it seems to me that it is not insignificant that its central character is also its most religious. From “Amok Time” onward, the ritualistic and spiritual nature of Vulcan culture takes a larger and larger role in the development of Spock’s character. With his strange powers like the Vulcan mind meld and nerve pinch, his quiet calm and cool reserve, Spock seems in touch with something otherworldly and ethereal. His bowl-like haircut mimics that of a Catholic monk and from Star Trek: The Motion Pictureonward, we frequently see him in ceremonial robes and engaged in deep meditation. 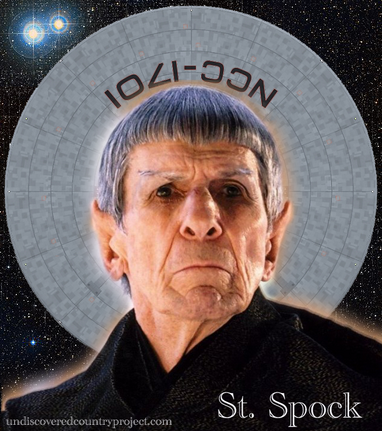 But Spock’s spiritual significance goes even deeper and I’ll be sharing more about it in my next post. Thank you so much for all you have put on here about Spock. I think he is the most important and wonderful character in Star Trek. There is something about Spock that brings out much emotion in me. I have tried to convey this to Leonard Nimoy on Twitter but I am sure his 20,000 plus followers have also tried to do the same. He never answers me and may not see my comments because of sheer volume. Like T’Nara’s comments, he himself brings out much emotion in people because his art digs deep in to his spirit and soul and exposes it for what it is-beauty and vulnerability. May Leonard Nimoy live long and prosper. God bless the man. I meant to say he has 200,000 plus Twitter followers! Quite a difference! Thanks for your kind words, Andrea. Spock means a great deal to many people and I hope we’ve brought to light some reasons why during Spocktober. Spock and Nimoy are big reasons for much of the sacredness and beauty we can find in Star Trek. I’m glad we’ve connected with so many people who love Spock. Thank you for joining the conversation!